Most Americans don’t spend any time considering the life experience of the pig they are eating. 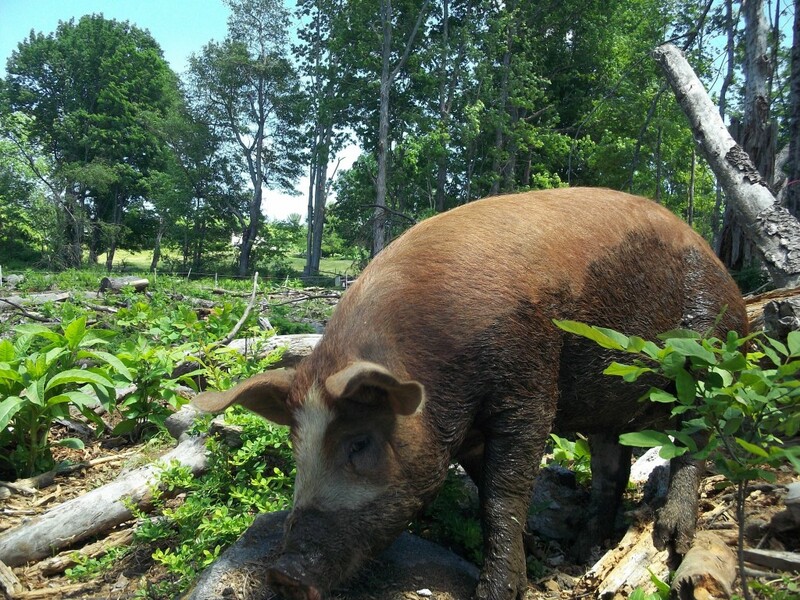 Given the chance to run, play and forage, these intelligent, inquisitive creatures thrive on roots, bugs and farm spoils without the terrible stress, added growth hormones, and the need for antibiotics found at industrial hog operations. Our heritage breed pork is dark and flavorful – streaked with gorgeous creamy yellow fat. The old English varieties we have free-ranged for us in the woods of central MA take twice as long to reach market weight but give us a superior product that honors the beast. We are honored that farm-to-table chefs at 1149, The Ocean House and 22 Bowens choose our pork for special events and name it among the best they have found. You can select for yourself a mix of chops, ribs, bacon and sausage that will forever change your opinion of “the other white meat”. Thousands of tons of pork are grown annually from pigs who never see the light of day or have the chance to root and explore outdoors. These clever noble beasts suffer terribly in confinement conditions. Thankfully a handful of pasture-based family farms across the country have led the way back to quality for a small market segment over the past 10 years. Pork like the Hereford x Tamworth cross shown above from our primary source herd allows us to reward our farm producers with top dollar for doing the right thing – assigning more time, work and land resources to growing meat that respects the animal. There was a time not too long ago when all food was local and livestock was free-ranged on natural forage. Pigs are efficient upcyclers, converting food waste, spoiled milk and vegetable scraps into prized glorious lard and amazing tasty flesh. Every output was an input in the old organic system. Regionally adapted breeds developed as farmers selected for hardiness, fattening and maternal instinct. Meat production required an entire year’s work – nothing was wasted. My old neighbor Fred Kenney collected food scraps from the Scout camp up the road to feed the Brook Farm hogs. The kids got new shoes in the fall around slaughter time when it was cool enough to kill and hang animals outside. They used “everything but the squeal”. In the 1950’s a population shift saw many people leave the family farm for wage-earning in the service and industrial sectors. Agrobusiness began growing pigs in factory-style operations to serve suburban markets no longer close to productive land or interested in food processing. More and faster was the goal – animal health issues were addressed with pharmaceutical solutions rather than good husbandry practices. Producers selected animals that would grow quickly and tolerate confinement. Pigs were given ractopamine growth promoters linked to trembling & liver failure that makes the meat dry and lean. But who cares ?? Cheap meat became available to almost everyone. And friendly regulatory environments were able to handle the inconvenient challenges of environmental degradation, dead pigs and damage to local economies. You can do better for your family. Our pastured heritage pork is free of antibiotics and hormones. It is marbled with tasty fat and delivers deep mineralized flavor from the roots and dirt eaten during a long happy life. The animals get certified GMO-free grain – never bread or stale baked goods. Our Piggy Pack gives you 6 lbs. of chops, 3 lbs. ribs, 4 lbs. sausage (breakfast, Cajun or smoked kielbasa) and 2 lbs. of bacon for $150. Contact us to reserve your share as we are processing about 2 pigs per month. Thank you for choosing local livestock production. We look forward to speaking with you soon.